Yes, I know it's been entirely too long since I've posted, but I've been busy. We went to the truck show this past weekend. It was awesome. Still haven't gotten the pics taken off the camera and put onto the pc, but as soon as I get them here I'll post a few. I'm still working on the other American Flag afghan. I haven't had as much time to work on it here lately as I would like, but I'm hoping that I'll be able to get more work done on it this week to make up for lost time. My husband is currently looking into several different trucking companies for a job change. We've narrowed it down to about 3 so far. I'll be filling out some paperwork in the next couple days and getting it mailed off so that we can get the ball rolling....or the truck as the case may be...hahaha. Anyway, just wanted to let ya'll know that I haven't fallen off the face of the earth. Hope ya'll have a great day. God Bless. 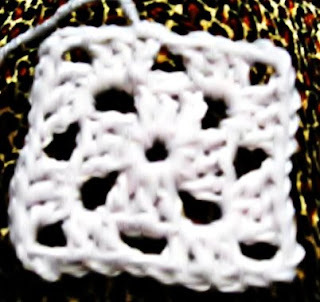 Well, I told ya'll I'd get some pics of my little squares. So...here we go. 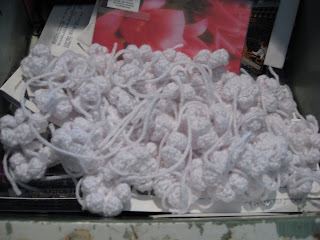 After I get them all done and pretty and stuff I'll sew them together and will have a pretty afghan. 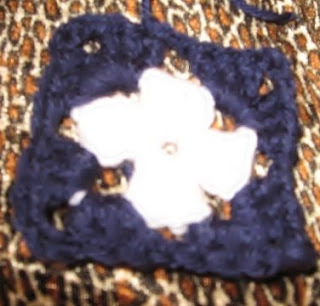 The pattern that I'm using also offers a pillow pattern that I may or may not make. Depends on what urge strikes me when I'm done with the Afghan. Oh, and ya'll....please disregard the leopard print background in these pics. I laid the squares on my leg to take the pics and I happened to be wearing my pretty leopard print jammies! Anywho....know ya'll know what I'm working one...as well as what my jammies look like. So, go forth and make something. Have a great day and Bod bless. Okay....was wandering aimlessly around cyberspace and found another cool blog. By a lady named Laurie. She calls herself Crazy Aunt Purl. She's got a book and everything. 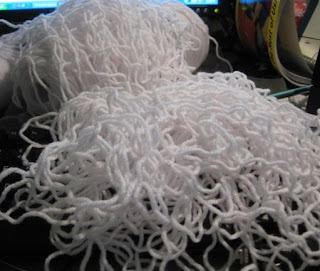 She talks about her life, her cat, her friends, and her knitting. I've started reading from the beginning of the archives and have reached February '06 so far. I read one or two of her most recent posts...decided I liked the way she wrote and wasn't scared to reveal a bit of herself to her readers. She's also a fellow southerner!!! So, ya'll go check out Crazy Aunt Purl. 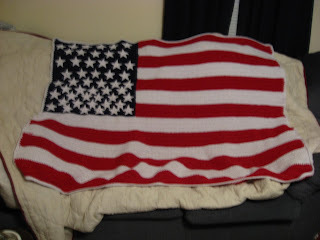 Okay so I told ya'll that I was starting another American Flag afghan. 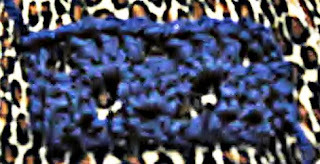 Well, I was once again wandering aimlessly through cyberspace, and found another pattern for a Flag afghan that I like much better. So I decided that I was going to rip out the 14 rows that I had already done on the other one and start all over again with the new pattern. 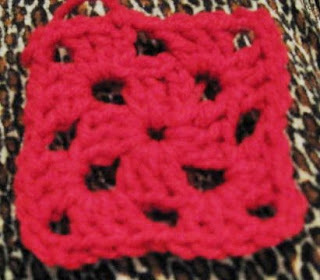 The new pattern consist of lots of little individual squares that are sewn together. I like the look of this one a bit more than the other one. It's looks more cozy and handmade. Anyway, I don't have any pics made up just yet. I'll post some as soon as I get some. My brother-in-law made it to Fort Carson today. He left early this morning. Well, that's all I've got for now. Hope ya'll had a happy Easter. God Bless. So it's been almost a week. And I still have nothing of importance to discuss. I haven't found anything interesting during my many hours of aimless wandering through cyberspace. 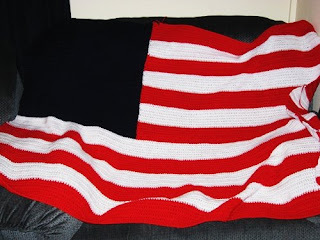 I'm in the process of making another American Flag afghan. My life is so totally boring. Anyway I guess I'll go out and wander around the neighborhood in search of Blog Inspiration. Have a Happy Easter and God Bless. Sorry about the brief absence, but I've been a bit busy lately running around like I've lost my mind. My afghan did make it to it's intended owner Saturday...all clean and washed and pretty. (I have pics, but still don't have them loaded on the pc just yet). We had a "family thing" at my mom's house Sunday. I gained a new sister-in-law today. I didn't get to make it to the wedding, but I met her Saturday and she's totally awesome. She thinks like me!!! After we'd been in the same room for about an hour we could finish each other's sentences. I promise I'll have pics up before we go to MATS at the end of the month. I have to clean out the camera so I'll have room for all the pictures I'll wanna take! Anywho, I'm gonna get off here and attempt to do something productive. Have a good one and God Bless.